I saw a patient today who informed me that she underwent a "sinus lift" procedure in the past. This statement made me realize that though ENTs are generally considered the sinus surgery experts, dentists and oral surgeons perform some sinus surgery as well like the "sinus lift" procedure. As far as I know, there is no ENT surgeon that does that specific sinus operation. 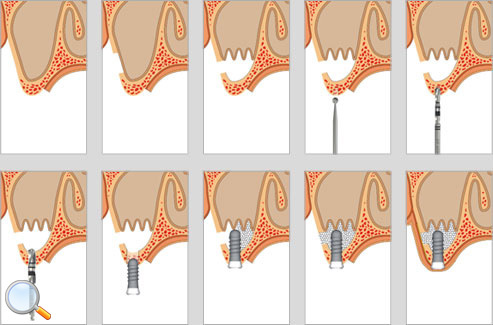 In essence, the "sinus lift" procedure is when the floor of the maxillary (cheek) sinus cavity is raised with bone graft material in order to accommodate a dental implant. Though there are many approaches to accomplish this task, most require entering into the maxillary sinus cavity. See image above. It is somewhat strange when considering that back in the old days (like a few decades ago), ENTs routinely performed a similar intra-oral approach (Caldwell-Luc) in order to enter into the maxillary sinus cavity when performing sinus surgery for chronic sinus infections. However, with the advent of endoscopic techniques, this approach is now very rarely performed. Indeed, we try to avoid any incisions if at all possible. So while ENTs have significantly decreased the use of intra-oral approaches for maxillary sinus surgery, the dental world has brought this approach back! Who knows? Perhaps ENT and oral surgery will join forces at some point in the future in order to perform an endoscopic "sinus lift" procedure in order to avoid making any incisions in the mouth!